Raise your hand if you start munching on empty carbs and cookies when you’re hungry. (I’m raising both.) If I don’t have my fruits and veggies prepped and ready to eat, I turn to a sleeve of crackers. But, I’ve found a solution to that problem! 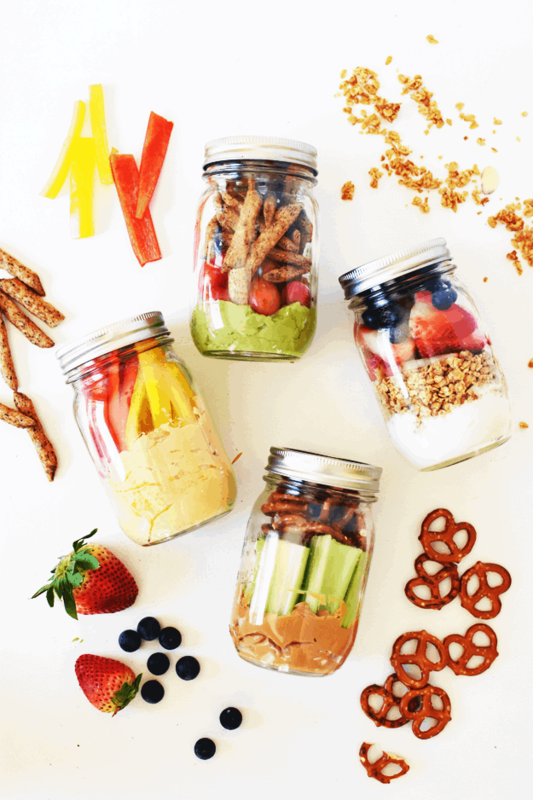 Four healthy grab-and-go snack jars! They take about 15 minutes to prep and will keep you on track for the week. 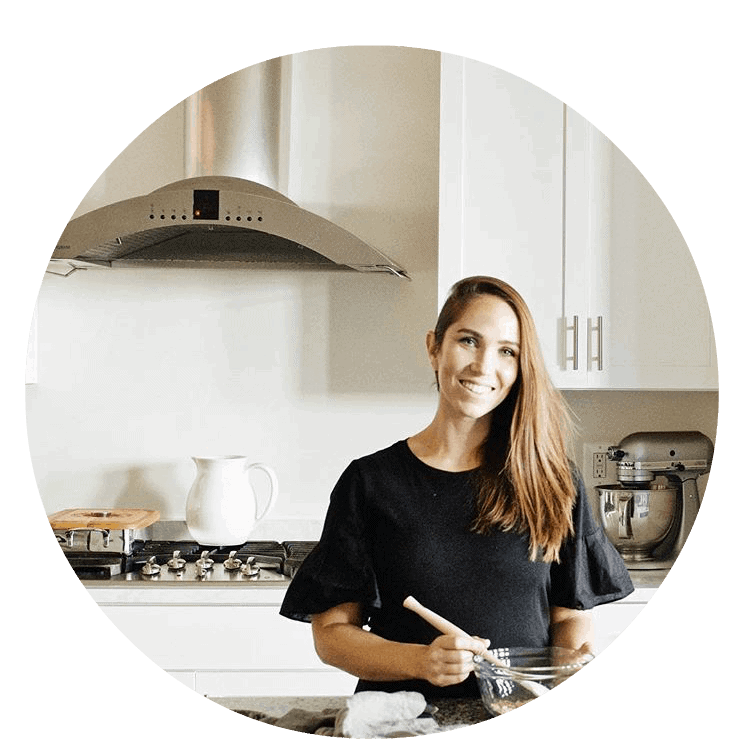 I made a combination of sweet, salty, savory, and spicy, so we have every flavor profile available to suit your current craving. 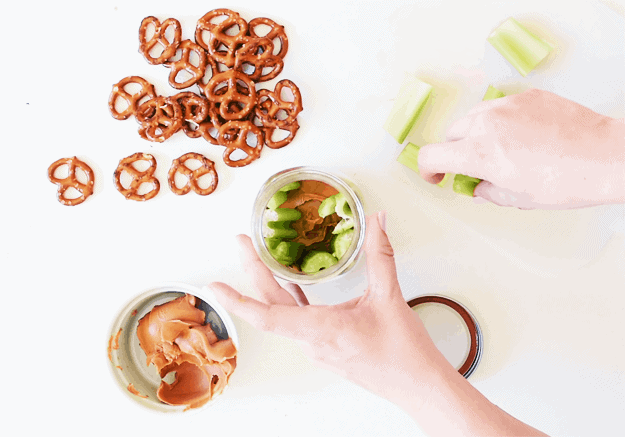 All you need are pint mason jars with lids, and your ingredients. By the way, have you seen the plastic lids? They seem more simple to wash and store than metal lids. Have you tried them? Let me know. Anyway, I’ve been a sucker for juicy bell peppers dipped in creamy hummus lately. Also, my craving for spicy foods is at an all-time high—I’m blaming it on the pregnancy hormones. Black bean habanero crisps dunked in guacamole are my life right now. Sounds like a great combo, right? Just make sure you chase it with a juicy grape tomato! And can we talk about peanut butter cravings for a hot second? My protein levels came back a smidge low last week, and I have been eating peanut butter straight from the jar. Do you ever do that? Maybe throw some raisins on there? No? Just go for the gold? If you want to keep things classier than I do, use celery as a dipping stick instead of a giant spoon. 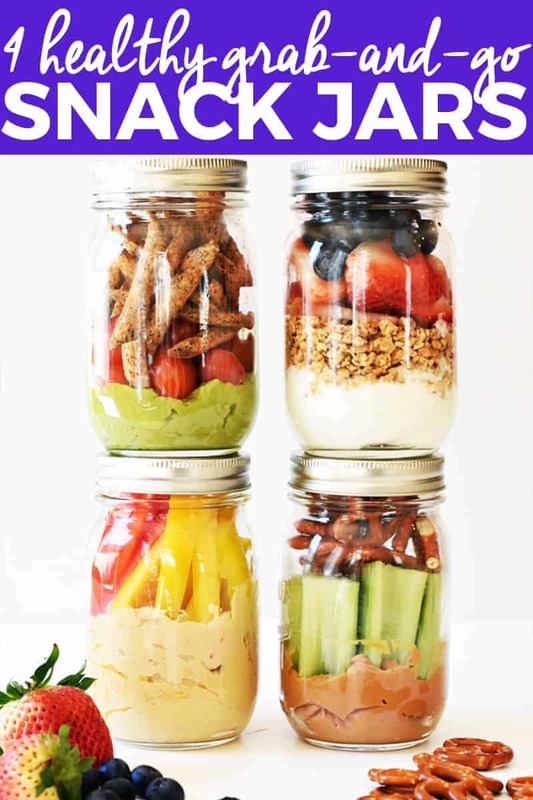 Now I jar-st really want to eat all of the contents of these healthy snack jars. 😉 You can keep them in the fridge for the week, and they are readily available for the kids and adults in the house. Eat them for a midday snack, or grab them on your way to work or after school activities. Watch the video below to see how easy these are to assemble, and then scroll down to see the full recipes. Enjoy! Looking for a quick, healthy snack? 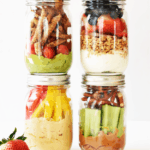 Make these 4 healthy grab-and-go snack jars, so you have a nutritious meal ready when you're short on time. Prepare first jar of bell peppers and hummus. Slice peppers into 1/4-inch strips. Use a spoon to layer in hummus, then top with slices of bell peppers. Seal and store in refrigerator. Prepare parfait jar. Slice strawberries. Layer in yogurt, granola, strawberries, and blueberries. Seal and store in refrigerator. 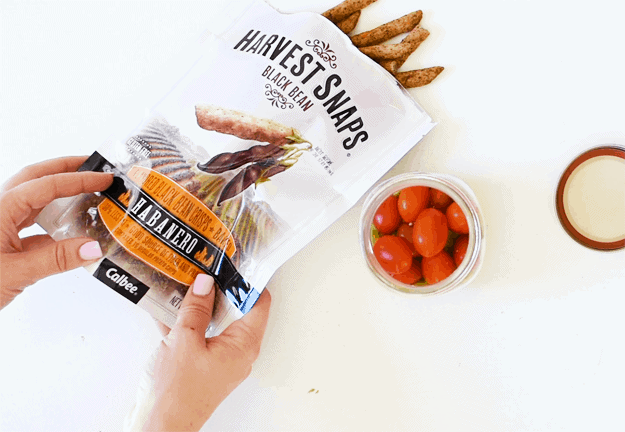 Grab your snacks as needed, whether you're on the go or need an afternoon bite to eat. Enjoy! Grab a spoon and plate just in case you want to transfer the contents of the jars for easier access and eating. Suggestion: snacks with pretzels and crisps, wrap in plastic wrap or snack bag, to keep crisp. This is a great concept!! Love all of these! I’m always looking for great snacks, these are perfect. These are so smart! Anything to make it easier!